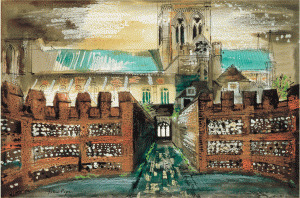 John Piper was an English painter, printmaker, stage designer and writer. After a period as an articled clerk in his father’s law firm in London (1921–6) he attended Richmond School of Art (1926–7) and the Royal College of Art (1927–9), where he studied painting under Morris Kestelman (b 1905) and stained glass and lithography under Francis Spear. From 1931 to 1933 he showed paintings annually in the exhibitions of the London Group at the New Burlington Galleries, London, and in 1934 he was elected a member and shortly afterwards Secretary of the 7 & 5 Society. He was included in the 13th exhibition of the society at the Leicester Galleries in London, with such abstract constructions as String Solo (1934; priv. col., see 1983 exh. cat., p. 75). In the same year he met the English painter Myfanwy Evans, who was to become his wife in 1937 and his collaborator in his later stage work. His first abstract oil paintings, such as Abstract II (AC Eng), date from 1935, in which year he visited the studios of Brancusi, Arp and Jean Hélion in Paris, and of Alexander Calder at Varengeville.